This chemistry dictionary offers the chemistry definitions starting with the letter T. These glossary terms are commonly used in chemistry and chemical engineering. Click the letter below to find the terms and definitions beginning with that letter. tantalum – Tantalum is the name for the transition element with atomic number 73 and is represented by the symbol Ta. tautomer – Tautomers are organic compounds that are interconvertible by a chemical reaction called tautomerization. Usually, the reaction involves the migration of a hydrogen atom or proton, accompanied by a switch of a single bond and adjacent double bond. technetium – Technetium is the name for the transition element with atomic number 43 and is represented by the symbol Tc. technology – Technology is the application of scientific knowledge or engineering designs for practical purposes. It can also refer to the equipment, machines, and products developed from scientific knowledge. tellurium – Tellurium is the name for the metalloid element with atomic number 52 and is represented by the symbol Te. temperature – Temperature is the property of matter which reflects the quantity of energy of motion of the component particles. There are several scales used to measure this value, such as Kelvin, Celsius, and Fahrenheit. tera – Tera is the metric prefix corresponding to 1012. Tera is expressed by the capital letter T.
Example: The average distance from the Earth to the Sun is 149,597,870,700 meters. This is roughly 0.15 Terameters. teratogen – A teratogen is a chemical that is capable of causing deformities in an embryo. Examples: Dioxin is an example of a teratogen. terbium – Terbium is the name for the lanthanide element with atomic number 65 and is represented by the symbol Tb. terminal reaction – A terminal reaction is the final chemical reaction in a progression of chemical reactions. terminus – Terminus refers to the end of a polymer molecule. terpene – Terpenes are volatile organic compounds derived from plants and made up of isoprene (C5) units as their backbone. Terpenes are generally associated with characteristic fragrances. Some terpenes are alcohols (e.g., menthol from peppermint oil) and some terpenes are aldehydes (e.g., citronellal). terpolymer – A terpolymer is a polymer composed of three different mer units. tertiary amide – A tertiary amide is an amide with three carbon atoms bonded to the amide nitrogen atom. Tertiary amides are often denoted by the shorthand notation of 3° amide. tertiary amine – A tertiary amine is an amine with three carbon atoms bonded to the amine nitrogen. Tertiary amines are often denoted by the shorthand notation 3° amine. tertiary carbon – A tertiary carbon refers to a carbon atom in a molecule or moiety bonded to three other carbon atoms. Tertiary carbon atoms are often expressed in shorthand as 3° carbon. tetrahedral – Tetrahedral is a descriptor of the geometry of a molecule in which a central atom forms four bonds which are directed toward the corners of a regular tetrahedron. Tetrahedral geometry forms a solid with four vertices and four sides, all of which are equilateral triangles. tetramer – A tetramer is a macromolecule consisting of four mer units. In biochemistry, a tetramer is a biomolecule consisting of four smaller molecules. Example: Hemoglobin is a tetramer made from 2 α- and 2 β- globin polypeptide chains. tetrel – A tetrel is an element belonging to the Group 14 or IVA group on the periodic table. These elements are also known as the carbon group family of elements. tetrose – A tetrose is a monosaccharide compound with four carbon atoms. Texas carbon – A Texas carbon is the name given to a carbon atom that forms five bonds. The name Texas carbon comes from the shape formed by five bonds radiating outwards from the carbon similar to the star in the Texas state flag. Another popular idea is that the saying “Everything is bigger in Texas” applies to carbon atoms. Although carbon usually forms 4 chemical bonds, it is possible (although rare) for 5 bonds to form. The carbonium ion and superacid methanium (CH5+) is a gas that can be produced under low-temperature laboratory conditions. Other examples of Texas carbon compounds have been observed. thallium – Thallium is the name for the basic metal element with atomic number 81 and is represented by the symbol Tl. theoretical yield – Theoretical yield is the quantity of a product obtained by the complete conversion of the limiting reactant in a chemical reaction. Theoretical yield is commonly expressed in terms of grams or moles. theory – In the context of science, a theory is a well-established explanation for scientific data. Theories typically cannot be proven, but they can become established if they are tested by several different scientific investigators. A theory can be disproven by a single contrary result. thermal – Thermal is an adjective pertaining to or relating to heat. For example, the thermal properties of a material refers to characteristics relating to heat, such as the ability to absorb or radiate heat. thermionic emission – Thermionic emission is the ejection of emission of ions or electrons by a hot object. Example: The electrons in a cathode ray tube beam are produced by thermionic emission. thermochemistry – Thermochemistry is the scientific study of heat that is released or absorbed during chemical changes. thermodynamic equilibrium – Thermodynamic equilibrium refers to a system that is losing energy to its surroundings at the same rate as the system is gaining energy. The overall change in energy of the system is equal to zero. thermodynamics – Thermodynamics is the scientific study of work, heat, energy, and the related properties of chemical and mechanical systems. thermoelectron – A thermoelectron is an electron emitted during thermionic emission. thermometer – A thermometer is a device designed to measure temperature. thermometry – Thermometry is the scientific study of measuring temperature. thermoplastic – A thermoplastic is a polymer that is softened or melted by heat and hardened by cooling. thermoset – A thermoset is a polymer that irreversibly becomes rigid or cures when heated. Example: Vulcanized rubber and fiberglass are thermosets. thermosetting plastic – A thermosetting plastic is a plastic thermoset polymer. thioketone – A thioketone is an organic compound containing a thiol group bridging two groups of atoms. The general formula for a ketone is RC(=S)R’ where R and R’ are alkyl or aryl groups. Example: The organic compound propanethione (CH3-C(=S)-CH3) is a basic thioketone molecule. thiol – Thiol is an organic sulfur compound composed of an alkyl or aryl group and a sulfur-hydrogen group. The general formula of a thiol is R-SH where R is an alkyl or aryl group. Example: The amino acid cysteine is a thiol. thiol group – The thiol group is an organic functional group composed of a sulfur atom bonded to a hydrogen atom. The general formula for a thiol group is -SH. third law of thermodynamics – The third law of thermodynamics states the entropy of a perfect crystal approaches zero as the temperature approaches absolute zero. thixotropic fluid – A thixotropic fluid is a fluid that becomes more viscous when stirred or agitated. Thomson effect – The Thomson effect is the generation or absorption of heat when an electrical current is passed through a material. thorium – Thorium is the name for the actinide element with atomic number 90 and is represented by the symbol Th. thr – Thr is an abbreviation for the amino acid threonine. Thr is often further abbreviated as G.
thulium – Thulium is the lanthanide element with atomic number 69 and is represented by the symbol Tm. tin – Tin is the basic metal element with atomic number 50 and represented by the symbol Sn. Tinning refers to adding a thin layer of tin to a surface. tincture – A tincture is an extract of a sample into a solution. Usually, the word tincture refers to an alcohol extract, although other solvents may be used. Tinctures most commonly are used to prepare extracts of plants, such as vanilla, lavender, and cannabis. However, the process also works with animal samples and nonvolatile inorganics, such as iodine or mercurochrome. titanium – Titanium is the transition metal element with atomic number 22 and is represented by the symbol Ti. titrant – Titrant is a solution of known concentration which is added (titrated) to another solution to determine the concentration of a second chemical species. 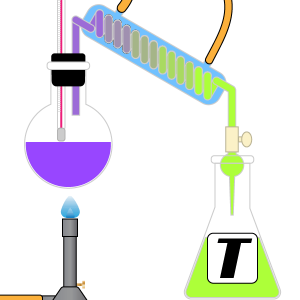 titration – Titration is the process in which one solution is added to another solution such that it reacts under conditions in which the added volume may be accurately measured. Titrations are most commonly associated with acid-base reaction but may involve other types of reactions as well. torr – A Torr is a unit of measuring pressure. One Torr is equal to one mm Hg or 1⁄760 of standard atmospheric pressure. 1 Torr = 133.322 Pa = 1.3158 x 10-3 atm. total angular momentum quantum number – The total angular momentum quantum number is a combination of the angular momentum quantum number, l, and the spin quantum number, ms. This quantum number is meant to represent the total angular momentum of a given particle and is expressed by a lower-case j.
transfer RNA – Transfer RNA is an RNA molecule that bonds amino acids to messenger RNA molecules. Transfer RNA is often abbreviated as t-RNA. trans isomer – A trans isomer is an isomer where the functional groups appear on opposite sides of the double bond. Trans isomers are identified by adding trans- to the front of the molecule’s name. transition interval – The transition interval is the concentration range of a chemical species that can be detected using an indicator. Usually, this refers to an acid-base (pH) indicator color change, but the same principle applies to fluorescence or any other visual indicator. Example: In a titration, the transition interval represents the concentration of a chemical required in order to see the indicator. Below this point, the intensity of the indicator may be too pale or dilute to detect. Similarly, if an upper limit is given in the transition interval, you won’t be able to see a color change or other evidence of the indicator, either. transition metal – A transition metal is an element from the B group of the periodic table. Transition metals have partially filled d sublevel orbitals. translational energy – translational energy is the energy of directional motion through space. Examples: Falling objects have translational energy; sliding objects have translational energy. transmute – To transmute is to change from one form or substance into another different form; to transform or convert. Example: Changing lead into gold. transuranium element – A transuranium element is an element with atomic number greater uranium’s atomic number of 92. Examples: Plutonium and americium are both transuranium elements. triangular bipyramid – A triangular bipyramid is a solid which has five vertices and six sides. The solid may be thought of as consisting of two pyramids which are fused together at the base that is an equilateral triangle. triboluminescence – Triboluminescence is luminescence (light) triggered by mechanical energy or electrical energy from a mechanical action such as friction. triglyceride – A triglyceride is an ester formed from glycerol and three fatty acids. trihalomethane – A trihalomethane is a class of compounds with chemical formula CHX3 where X is any halogen atom. Trihalomethanes are commonly abbreviated as THMs and have the same tetrahedral orientation of methane. Trihalomethanes do not have to contain the same halogen in all three positions. The compounds that do have all three halogens the same are called haloforms. Example: Chloroform (CHCl3) is a trihalomethane compound. trimer – A trimer is an oligomer containing three mer unit components. Trimer also refers to a product of a chemical reaction formed from three identical reactants. Example: The acetaldehyde ammonia trimer is formed from three acetaldehyde (CH3CHO) molecules and three ammonia (NH3) molecules. triose – A triose is a monosaccharide with three carbon atoms. Example: Glycerin (C3H8O3) is a triose molecule. triple bond – A triple bond is three electron pairs which are shared between two bonded atoms. Triple bonds are denoted as three parallel lines in chemical structure diagrams. Example: A triple bond exists between the atoms of divalent nitrogen, N2. triple point – Triple Point is the temperature and pressure at which solid, liquid, and vapor phases of a particular substance coexist in equilibrium. A specific case of phase equilibrium. Example: The triple point for water is at 0.01° Celsius at 4.56 mm Hg. Example: The tritiation of fluoroform (CHF3) is CTF3. tritide – A tritide is the anion of the hydrogen isotope tritium: 3H–. tritio group – The tritio group is the hydro functional group (-H) where the hydrogen atom is replaced with the hydrogen isotope tritium. tritium – Tritium is an isotope of hydrogen containing one proton and two neutrons. Tritium is radioactive with a half-life of 12.32 years. Tritium is often denoted by the symbol T.
triton – A triton is the cation of the hydrogen isotope tritium 3H+. tritonation – Tritionation is a chemical reaction that involves the transfer of a tritium cation or tritide to a molecule. is the tritonation of acetone. troy ounce – A troy ounce is a British Imperial mass unit typically associated with weighing precious metals. 1 troy ounce (ozt) = 31.1034768 grams. trp – Trp is an abbreviation for the amino acid tryptophan. Tryptophan is also abbreviated as W.
tungsten – Tungsten is the name for the transition element with atomic number 74 and is represented by the symbol W.
tutty – Tutty is an alchemical name for the compound zinc oxide (ZnO). Tyndall effect – The Tyndall effect is the scattering of light as a light beam passes through a colloid. The individual suspension particles scatter and reflect light, making the beam visible. The amount of scattering depends on the frequency of the light and density of the particles. Example: The visible beam of headlights in fog is caused by the Tyndall effect. The water droplets scatter the light, making the headlight beams visible. tyr – Tyr is an abbreviation for the amino acid tyrosine. Tyrosine is also abbreviated as Y.